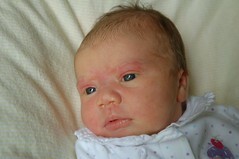 Eleanor and Mommy are home (as of Tuesday evening) and we've been doing very well. She's eating and pooping like a champ - she's also been sleeping fairly well. Anne Marie's reaction has been about as good as we could have dreamed. She's very interested in the baby and has been very gentle. When Eleanor cries, Anne Marie is very concerned for her and wants to comfort her. We'll try to get some pictures of the two of them together sometime soon - but when both are awake, we usually have our hands full without trying to add a camera too. We did have a photo shoot for Eleanor while Anne Marie napped today - the fruits of which you can see here. I also uploaded some other pictures from our hospital stay here. I will try to post more info, including my birth story soon. Thanks for all the well wishes.